Laaf Lastpost, ready to make pancakes. Of course, we wish we were at Polle’s Keuken to celebrate this happy day, but alas, no can do! If you’ve never been to Polle’s before and would like to try it out, check out our review here. 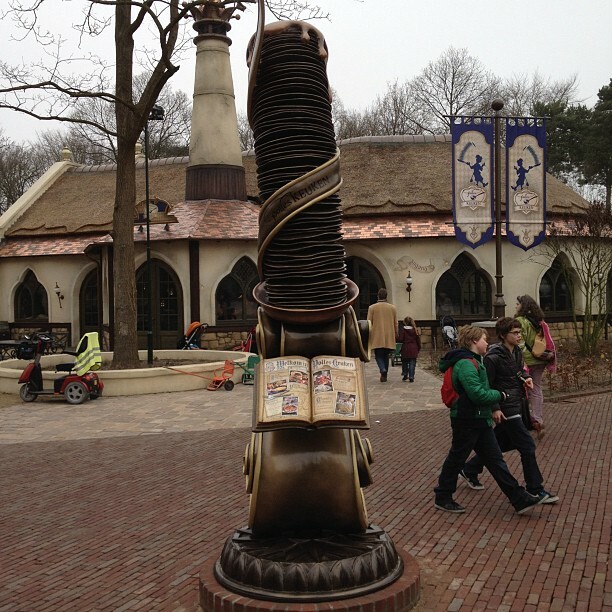 While you’re in there, you can pick up some of Polle’s pannenkoek mix, to give your pancakes that ‘Efteling’ touch. Scroll down for your Polle’s Keuken fix, and see the menu to get some ideas for your own pancakes! The Menu. Click for a closer look! 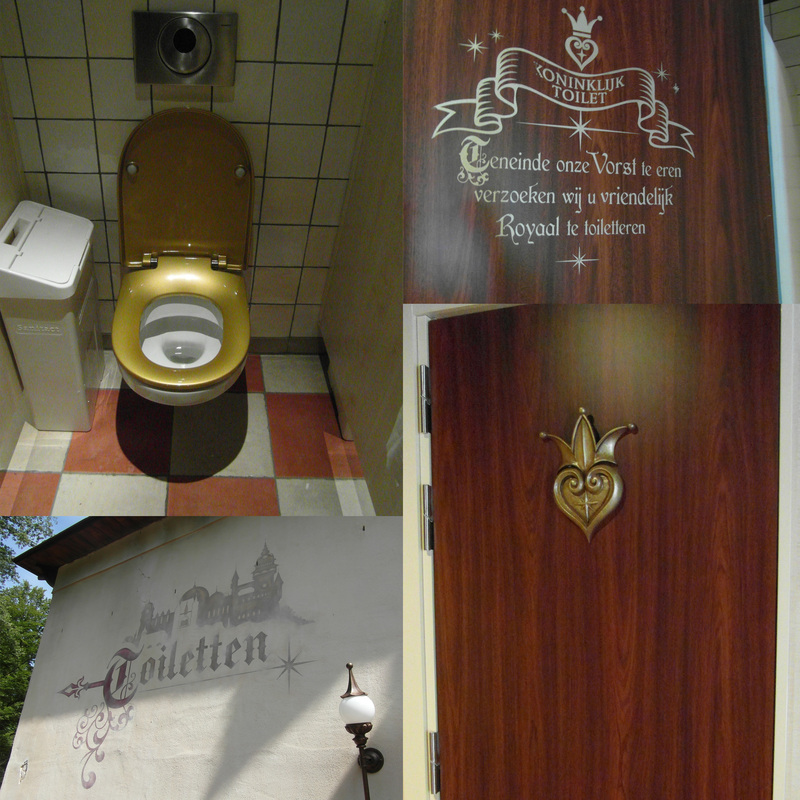 Last year, it was pointed out to us by one of our followers that Efteling had a golden toilet. A. Golden. Toilet. Why had we never come across this before? And where could we find it? Well, the answer is: behind Polle’s Keuken. So many times we have been rushing past that pancake restaurant to get to wherever it is we’re going, and we’ve not really paid much attention to the fact that there are toilets behind the building. If we ever did visit Polle’s, we’d be using the rest rooms inside the building. Naturally of course, on our last visit, we had to pay a visit specifically to see this golden toilet! The things we do for research! Take that message how you will! There is a Golden Toilet in both the male and female toilets. Has anybody else visited this golden throne? Aquanura has won a THEA (Themed Entertainment Association) award for Aquanura (outstanding achievement). The ceremony will take place in April 2013 at the Disneyland Resort. Bart de Boer tweeted the news earlier today. 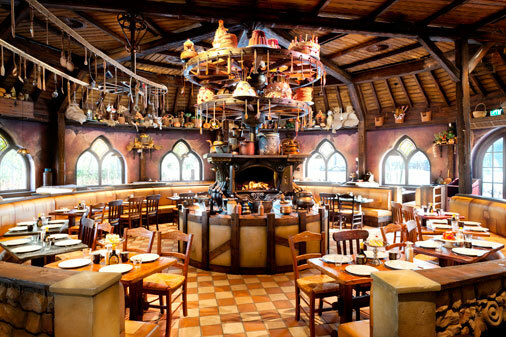 He also mentioned that the IAAPA (International Association of Amusement Parks and Attractions) has awarded Efteling a Brass Ring award in the category of Food and Beverage for Polle’s Kitchen. 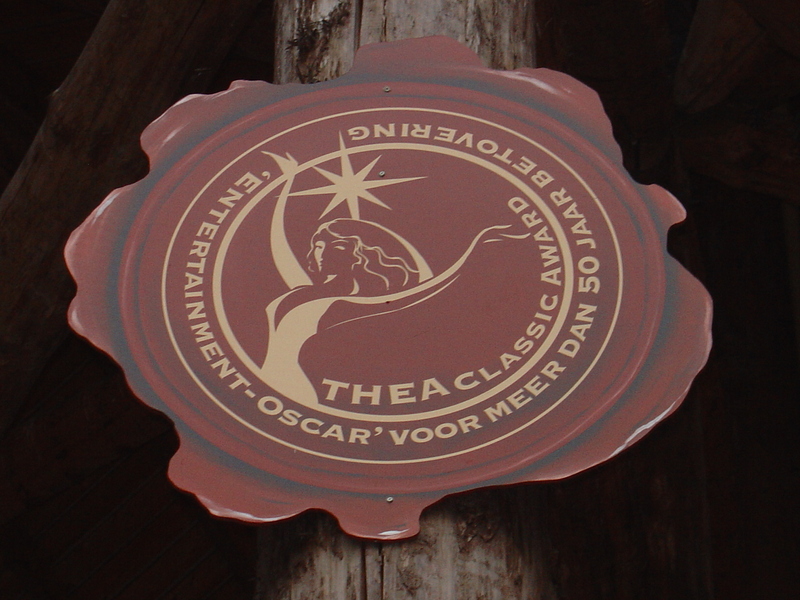 One of Efteling’s older THEA awards. The time has come, to talk about pancakes. 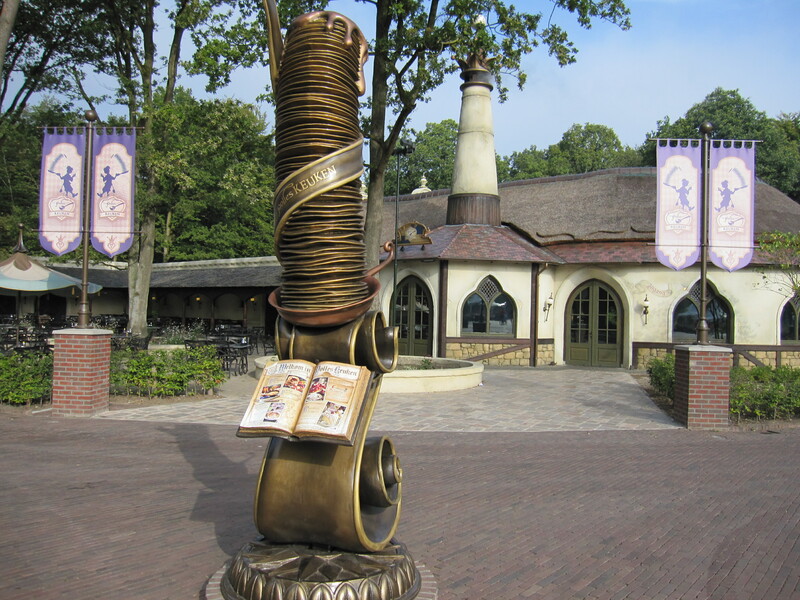 Aside from the obvious hundreds of great reasons to visit Efteling, Polle’s Keuken is high on the list of must-dos! It only opened on March 30th of this year, but the frequent line of customers waiting to get in tells us that it is already a favourite of Efteling guests. Pancakes are available from 11:30 am, just in time for a late breakfast. We were there bang on that time, and it was very quiet the whole time we were there. Most of the lines forming outside seemed to come later in the day, for lunch and dinner. The first thing you’ll notice when entering the building is the theming. There is a massive ‘oven’ in the middle of the floor, with tables surrounding it, a bar to the far left of the room, and on your immediate left as you enter, is where the pancakes are born. There are a lot of tables inside and out, so don’t worry about getting a table! The waiters and waitresses are dressed in traditional chefs outfits, to complete the theme. 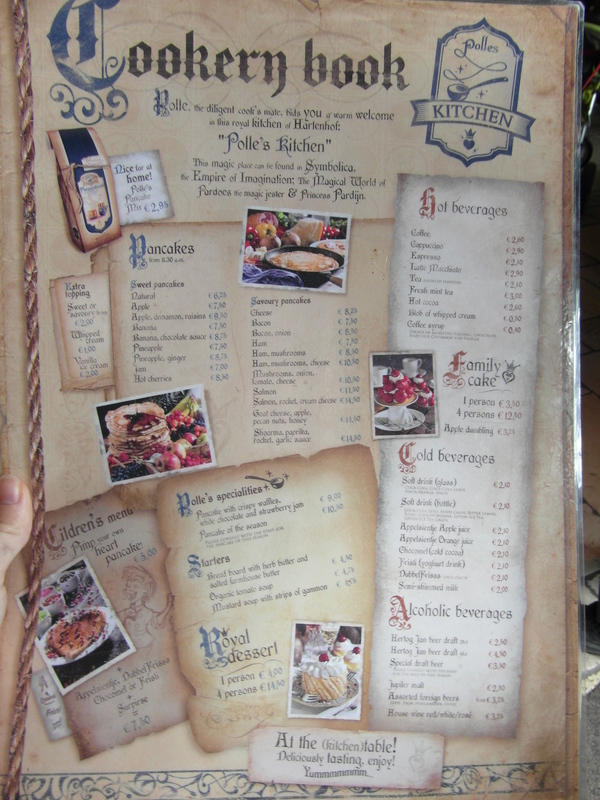 You will be handed a menu upon arrival at the restaurant, and then you can pick your table. Menus are available in English if you ask, which is great news, because there are a lot of items on that menu! There are savoury pancakes such as salmon with rocket and cream cheese, goat’s cheese with honey, apple and pecan nuts, and bacon with onion. The sweet pancakes include apple with cinnamon and raisins, pineapple with ginger, and hot cherries. Got a child with you? They feed those here too! Children can get a heart-shaped pancake with toppings such as sprinkles that they can put on themselves; this is known as the ‘Pimp Your Own Heart Pancake’ option, and comes with a drink and a ‘surprise’. Don’t like pancakes? You’re in the wrong restaurant! But joking aside, there are options at Polle’s Keuken for the folks who don’t fancy nibbling away at a pancake. You can order a ‘Family Cake’ or a ‘Royal Dessert’, which are for between 1 and 4 people. There is also a cake carousel located to the left as you enter. Drinks include the usual tea, coffee and hot chocolate, but also available is a fresh mint tea or a latte macchiato. Beer and wine are also available from the bar. Another neat idea that Efteling had, was to bag up the special pancake mix and sell it in bags for 2.95 in the restaurant. You can also buy gift packs of the mix which comes with a chef’s hat and a wooden spoon (also available at the main entrance for around 6.95). We had the Pineapple and Ginger pancake, and the Hot Cherries pancake. 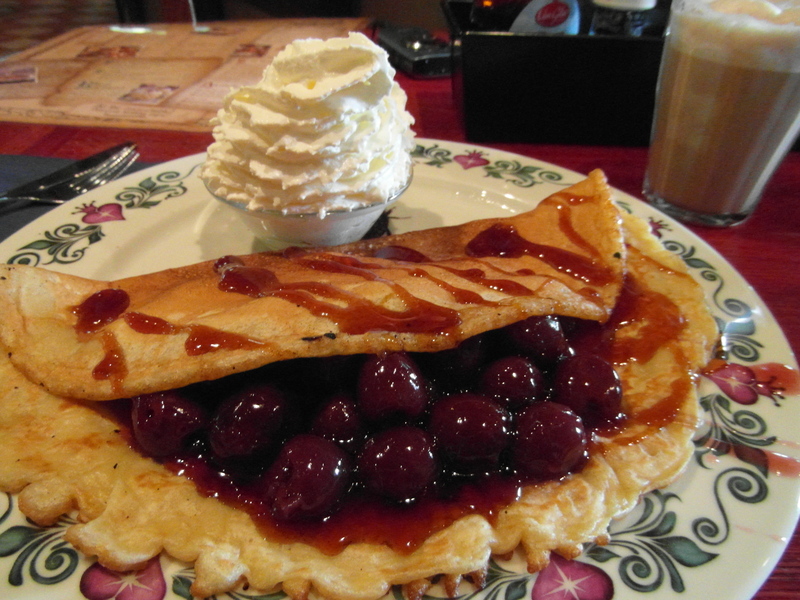 The Hot Cherries were snuggled inside the hot soft pancake, with whipped cream on the side, and it tasted divine! The Pineapple and Ginger pancake was also surprisingly nice, considering the rather unusual combination. There was sugar and syrup on the table, along with salt and pepper, in case you ordered a savoury pancake. We highly recommend Polle’s Keuken if you love pancakes, or cakes in general! Check out our photo album for a LOT more photos of the restaurant. …Or ‘Pancake Day’ to the English-speaking. Of course, the U.K had Pancake Day back in February, however it seems that the Dutch are celebrating it today. There was also a pancake relay-race between two schools taking place outside of the restaurant. Polle’s Keuken has been open for a little while now, but today was the official opening, since it was officially Pancake Day! Now there is no excuse at all to not go and eat lots of pancakes! Have you checked out the Efteling UK Facebook page yet? Check us out for even more Efteling goodness! If you are visiting Polle’s Keuken and you aren’t sure what is on offer inside, there is now a very large, fancy-looking menu outside of the restaurant in the style of a book. Photo from Bart de Boer. I came across a great video on YouTube, taken by mieluhkuh, of the interior and exterior of Polle’s Keuken. It show the detail on the outside of the building, including outside seating, and the Happiness Station where you can buy ice cream. Inside it is very Efteling-esque, quite dark, quirky and charming. Make sure you watch all of the video to see all the features that this new pancake restaurant has! 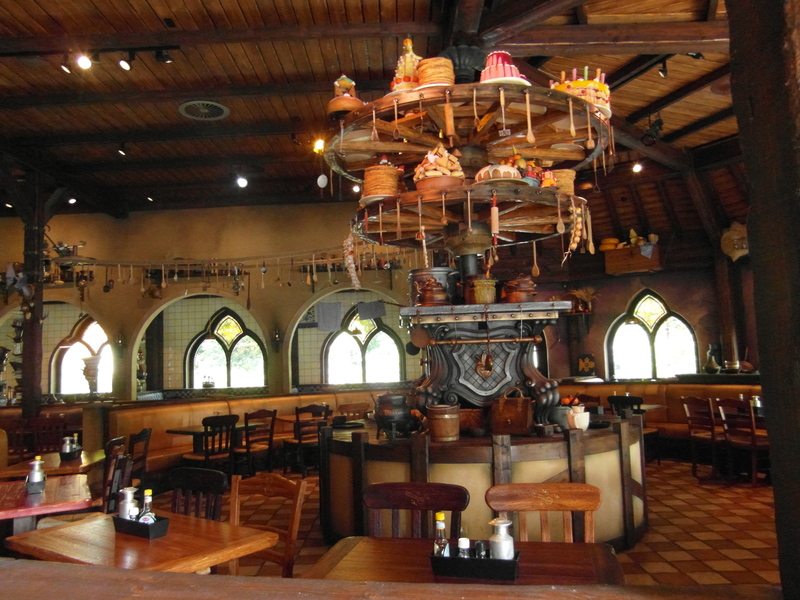 Have you ever wandered around Efteling and thought to yourself; ‘I would love to eat some pancakes!’? Well, now you can! Polle’s Keuken (Polle’s Kitchen) is now open! From February 1st (although the official opening isn’t until March 30th) you can visit the pancake kitchen every day from 11:30. With no less than 10 savoury and 10 sweet pancakes to choose from, plus some yummy desserts, you can’t go wrong!